Category: How about being nice to the environment? Spending whit care, how did that go? One of my October challenges was to spend with care, looking back now I’m not sure that it went that well, I managed to spend a lot. However I would say that some of the purchases were perfectly valid such as vacation trip to the US, a weekend trip to Hamburg and plane tickets for a trip to Norway later this year. I was so in need of vacation and it was also on the list of things to do for 2012. I also bought some more furniture for my home, true I could have waited for a month to keep them out of the October shopping still I’m a very impulsive person and have a tendency to just do things. The kitchen table haven’t been assembled yet since I need to move the old one first, once it’s up I will get some pictures on here and you can see what I mean. I did also buy some clothes, most of it in the US. I was on vacation and it was cheap, and it wasn’t H&M, all but one post on my vacation trip there is still waiting for me to post them together with some other ones on what I have been up to this year – something about there only being 24hr in a day and sleep is required as well. I have thought twice before purchasing some things during the month and I don’t think that will change, as giving a thought to the environment, the rest of the world and what you really need before buying it does keep you back. My decision to stop shopping at H&M for now also make a difference as plenty of my stupid impulsive shopping is taking place there. Well, I think I might try it again down the road, however Christmas is coming up and this year it’s what we call a BIG Christmas, when the whole (and I mean the whole) family meet up at my mother’s place. Christmas presents are a must! Purchased with care of course. I almost forgot, during the month of October I became a collector of Starbucks mugs, so I might have gotten a few of those as well…oops! I’m home sick again, unbelievable! Even sick people have to eat though, unfortunately I have been a bit lazy with the shopping lately (based on previous doses of being home sick) so I had to rummage through my kitchen to see what I could find. 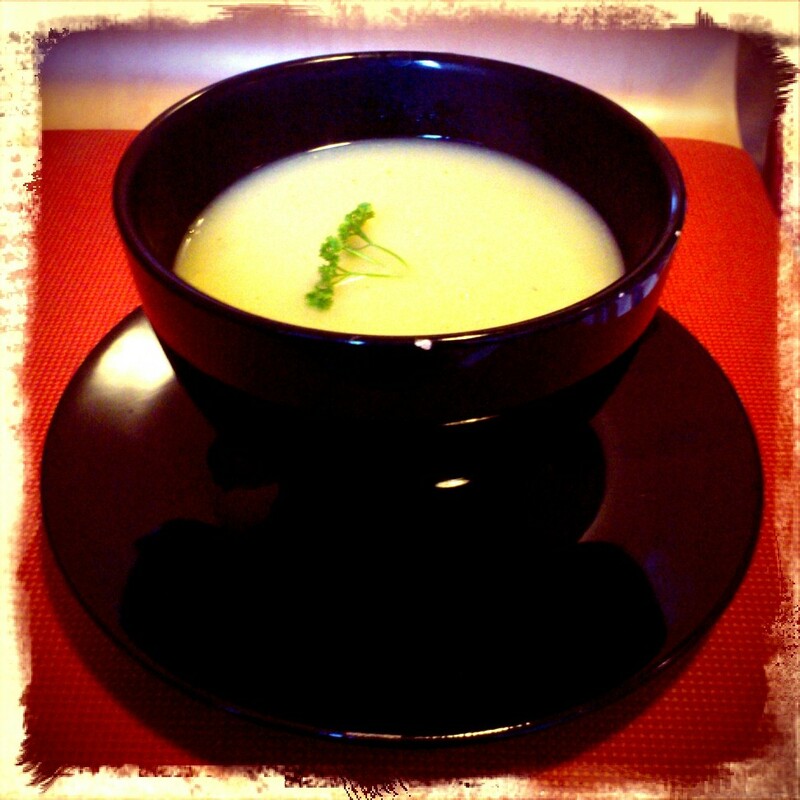 The result was a fairly creamy potato soup that is heaven for a sore throat (the bacon was out of the freezer and in the microwave defrosting before I remembered it is Meat Free Monday). Start with peeling the potatoes (if I was particular I will give you the name and type, I however usually just buy the cheapest ones at the store) and chop them into nice sized chunks, bring the water to boil together with a splash of salt. 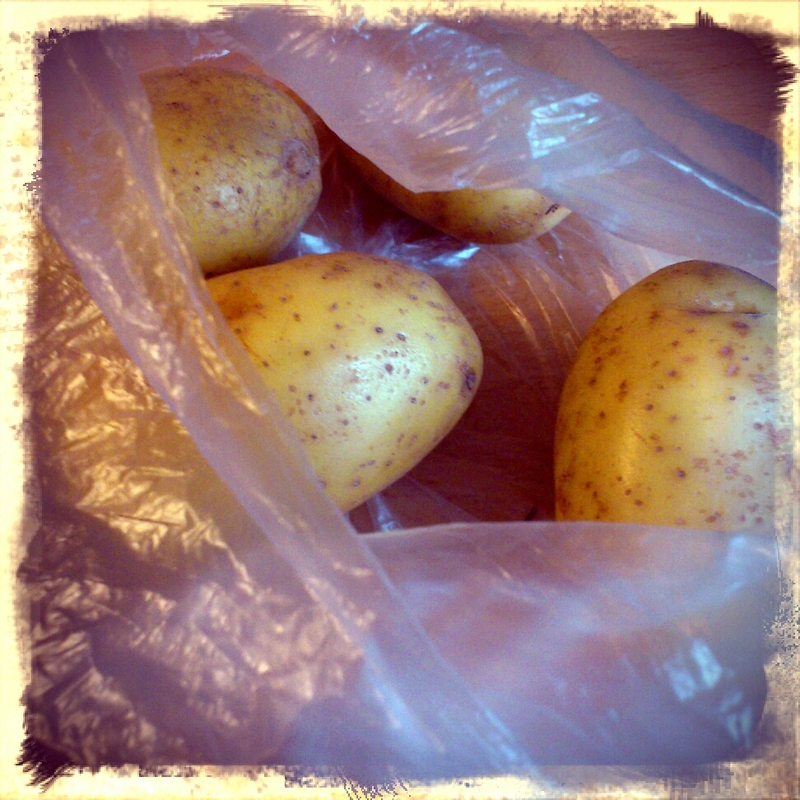 Chuck the potatoes into the water and add bullion, let it boil for about 25-30 minutes. Add some parsley and the dried milk and stir. Use the kitchens best friend, Mr Mixer, to make the soup into a smooth creamy soup, pepper to taste. 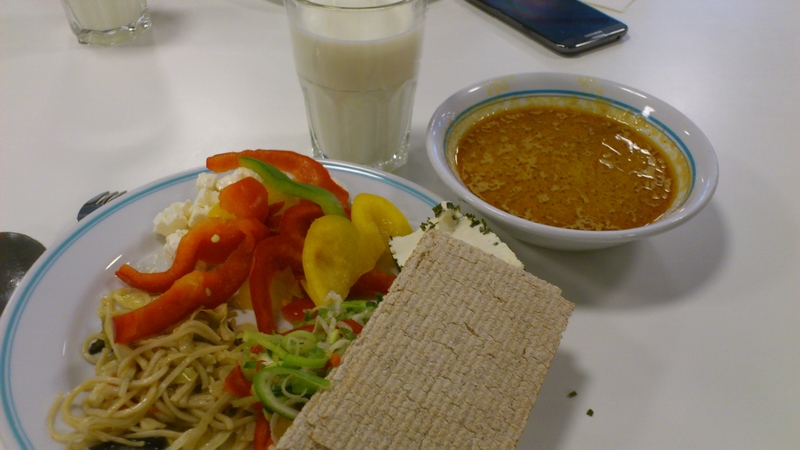 The super exciting lunch served in the company canteen today, for us that doesn’t eat meat. The red curry soup tasted better than it looks, and the rest wasn’t that great. As it now is 10:20pm I will admit that my dinner was carrots and dip, so don’t expect some fancy dinner update. See, I did remember that today is Monday and no meat day! What I didn’t remember was to bring my phone with me to the canteen so I couldn’t take a picture of my tomato soup and salad lunch. I promise there was no meat in it, and I have two witnesses – now back to work, and if you all are lucky there will be an awesome update on my awesome weekend later. As well all know, today is Monday – yesterday was Tuesday. 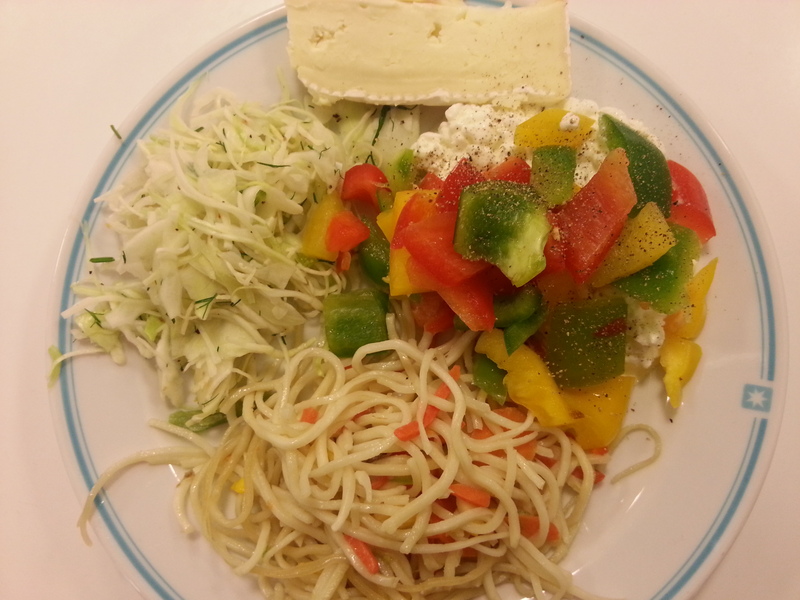 Vegetarian lunch wasn’t that bad at work today, noodles with veggies in and some cottage cheese, pepper and cabbage. I’m already hungry again though, should have made myself an afternoon sandwich. Any good ideas on what to have for dinner tonight? 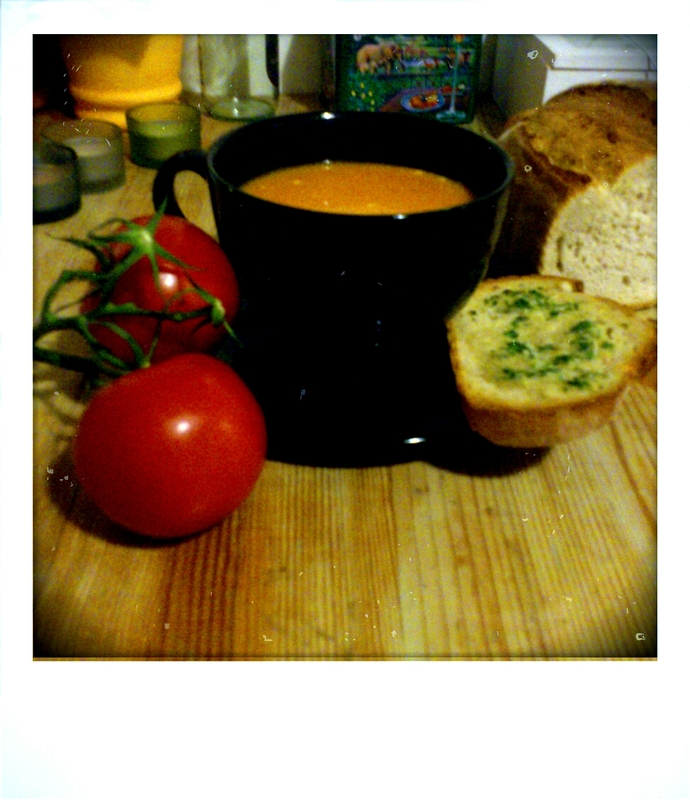 For this weeks meat free dinner I made a tomato soup with garlic soup, the inspiration for the soup come from a site that one of my loyal readers tipped me about when I made the announcement of meat free Mondays, 101 Cookbooks. It was very easy to make and there are not that many changes I would want to make to the recipe. Start by adding the butter or oil to a pot (make sure it’s large enough), I used both, then add thinly sliced onion and salt. 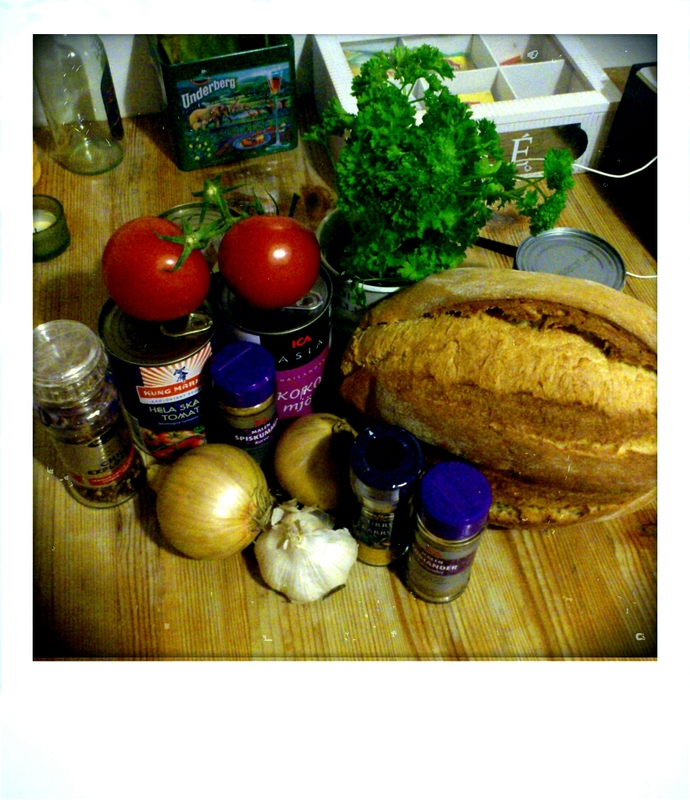 Then stir in the spices, curry, coriander, cumin and chili flakes followed by the tomatoes. In the original recipe it then states to add 1.5 liter of water, I thought that the soup was a bit watery though so for the future I will start with one liter of water. After 15 minutes of simmering on the stove, use a handheld mixer to puree and add coconut milk, if the soup now is too thick add more water. Taste and add more salt or spices if needed and serve. I had some leftover garlic butter from Friday night when I had a nice steak, so all I had today was add chopped parsley and put it on the bread. I have the oven for 225° degrees and the bread only have to be in for a few minutes.